Description: Amtrak No. 44 at 13:13 hrs. Description: P448, the eastbound Lake Shore, passing through Huntington. Description: Amtrak Southbound City of New Orleans P059 at Somerville, Ms. Description: The AOE rest in Savannah. Description: P098 northbound at Maitland. Description: The eastbound Empire Builder approaching a stop at Vancouver. Description: Taken while driving up Sugar Run Rd this eastbound Amtrak train goes past while we were driving to Gallitzin. This shot was taken without even looking through the view finder. Description: Number 99 and one of three remaining Phase III P42s pull the SW Chief at track speed, bloking the rest of the train from view. Description: Northbound Amtrak 5-car push-pull. Coincidentally, this was taken on my last day of work. Description: Westbound Ann Rutledge departing Kirkwood station with fall colors at their peak!! Description: Amtrak #99 Train 49, the Lakeshore Limited blows through Hammond depot heading west into Chi town. Description: note the blue on the bolt o nose is a different color than the rest of the engine. 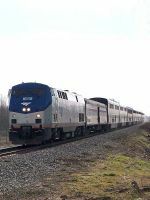 Description: Amtrak 880 sits in Charlottesville on the VA Autumn Flyer. Description: Amtrak 881 has just pulled into the museum property and poses on Main Street in Spencer. Description: Amtrak 881 VA Autumn Flyer sits at the NCTM after unloading passengers. Description: Amtrak 880 the VA Autumn Flyer goes by Lee on its way to Charlottesville,VA. Description: The Virginia Autumn Flyer sits along Main St. at the NCTM in Spencer,N.C. unloading it's passengers. Description: Passengers disembark the coaches of the Virginia Autumn Flyer as the trains sits on NCTM tracks at Spencer,N.C.